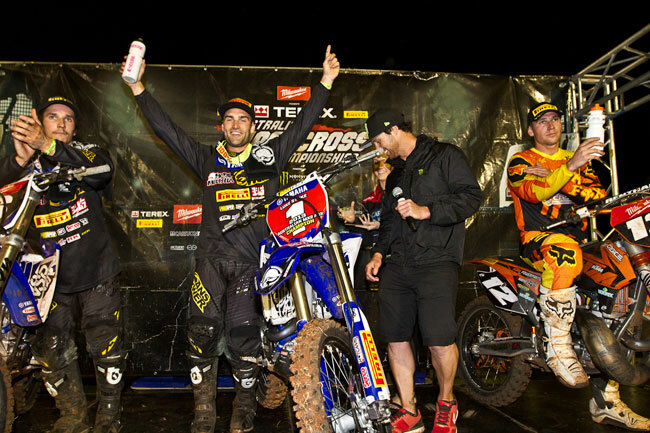 Australian rider Matt Moss has won the 2013 Australian Supercross Championship winning the final round of the series. Second overall in the series was Jake Moss and third Josh Hill. 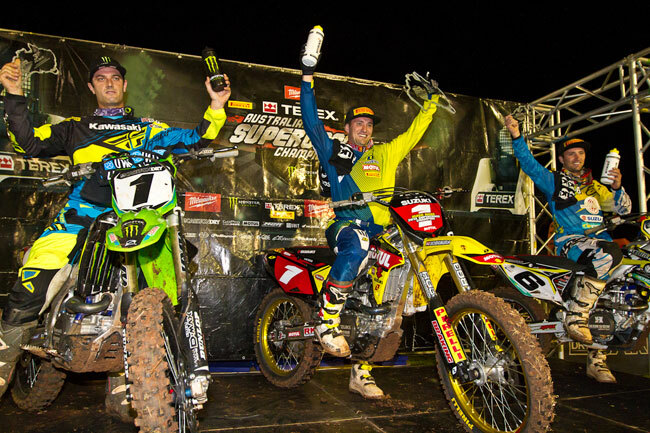 Moss, Styke and Wilson crowned Australian Supercross Champions in Queensland. 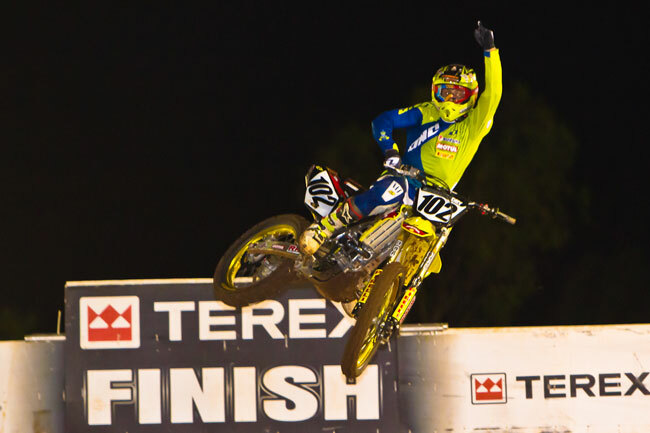 Team Motul Pirelli Suzuki’s Matt Moss clinched the 2013 Australian Supercross Championship in a dramatic final round at Tooowoomba, Queensland, on Saturday night. Moss qualified first, won his heat and led all 20 laps of the main event to seal his second championship of the year alongside the MX Nationals title, however it was the controversy that unfolded behind him that stole the show. The SX-Open main event started with Moss getting the holeshot, trailed by twin brother Jake Moss (Campbell Mining Suzuki) and American import Josh Hill (Hart and Huntington/InsureMyRide/DPH Suzuki) – the trio entering the night separated by just seven points. Hill made a move on Jake near the end of lap two, before a counterattack over the finish line entering lap three saw the pair collide in the turn following and Hill go down. The incident forced the series leader out of the race, become an all-Moss battle for the title out front. Jake, who was two points in arrears of Matt coming into the weekend, had to pass for the victory if he was to steal the championship, but it wasn’t to be – Matt comfortably winning by 3.063 seconds to win the championship. Matt Moss was flawless in his Australian Supercross Championship victory at Toowoomba. Image: Grant Reynolds/FiftySix Clix. The result handed the Moss brothers first and second in the championship, with Hill salvaging third despite a DNF in the final round of the season. A protest was lodged by the Hill camp post-race, however no communication has been made on the outcome. “My feeling right now is indescribable,” 25-year-old Moss commented. “I just wanted to do my own thing, stay clean and that’s exactly what I was able to do. All day long I felt confident, I knew I had to do my job and get a good start in the main, which is how it turned out. Jake denied any wrongdoing in the clash with Hill, proud to be 1-2 in the championship with his brother after a quality campaign. “I’m sore. No-one knows, but I dislocated my shoulder last weekend and haven’t been able to ride all week,” Jake said. “I felt good, just made a couple of mistakes and lost the rear of Matt. Me and Hill came together, he came across and didn’t want me to have that inside. Matt Moss won the round and series over Jake Moss, with former champion Jay Marmont third. Image: Grant Reynolds/FiftySix Clix. Third for the weekend was outgoing champion Jay Marmont (Monster Energy Kawasaki), picking up his first podium since Darwin’s season-opener to bookend the series with podiums. He ended up fourth in the championship four points behind Hill. Motorex KTM’s Daniel McCoy was fourth at Toowoomba and wound up fifth in the standings, tied on points with Marmont after his final outing with the team. CDR Yamaha’s Lawson Bopping bounced back from injury to claim a fighting fifth without the full support of the team on hand, while rookie Hayden Mellross (Carlton Dry Honda Racing) was an impressive sixth. Trailing him was another Honda young gun in Jacob Wright (Tattoo Racing Australia). Completing the top 10 was local Matt Haworth (Kawasaki), Lewis Woods (Suzuki) and Brett Metcalfe (Kawasaki), who crashed twice during the main event in a frustrating finish to his homecoming. (Comment on the 450 class from www.motocrossactionmag.com under the heading "Did the moss brothers tag team Josh Hill ?" Suzuki rider Matt Moss, who was five points behind U.S. rider Josh Hill coming into the final round, dominated the 20-lap final, leading from start to finish to clinch both the race win and title ahead of his brother Jake Moss. Jay Marmont was third. The race was not without controversy as American Josh Hill and Jake Moss came together on the second lap of the main event—and according to Australian sources the Aussie sanctioning body is reviewing the incident where Jake Moss went inside a Tuff block. No matter what happens in the review, the other Moss, Matt, ended his 2013 season with both the Australian National Motocross Championship and the Aussie Supercross crown. Matt Moss said,“I knew I could win. It was whether Jake could beat Josh Hill. Once I saw that Jake and Josh had come together it was smooth sailing. Having my brother behind me, I knew he wasn’t going to do anything to jeopardise it for me. I have some plans for 2014, I definitely want to defend both titles, but before that I want to go and race the first five rounds of the AMA Supercross in America. I feel I am fit and ready so why not give it a shot now." Luke Styke added the SX-Lites title to his MX2 outdoor crown, winning Tooowoomba from Brenden Harrison and Luke Arbon. Image: Grant Reynolds/FiftySix Clix. The SX-Lites main event was just an thrilling, with Serco Yamaha’s Luke Styke scraping through to claim his second title of the season aboard the YZ250F after entering the finale five points behind defending champion Gavin Faith (Carlton Dry Honda Racing). Styke fended off determined Queenslander Brenden Harrison (Choice Motorsports KTM) for the victory by 0.783 seconds, with Luke Arbon (Serco Yamaha) claiming his first podium of the season in third. It was a first lap fall from Faith that set up a nail-biter though, requiring a second place finish to retain the title if Styke won. He eventually climbed to fifth, but another incident on lap 12 of 15 dashed his hopes. Styke won the championship from Faith, while Ryan Marmont (Raceline Pirelli Suzuki) ended the year third after finishing a lowly sixth in Toowoomba. Fourth for the round was top privateer Taylor Potter (Honda) from Nicholas Sutherland (TM Racing Australia), before Marmont, Kayne Lamont (Choice Motorsports KTM), Faith, Wade Hunter and Luke Wilson rounded out the top 10. Corey James won the round, but Jay Wilson the Under 19s title with Jake Emanuelli third. Image: Grant Reynolds/FiftySix Clix. Jay Wilson was crowned Under 19s champion for GYTR Yamaha, racing to a conservative second in the main event to win his first Senior title for the Scott Bishop-managed team. Four straight wins and a second comfortably handed him the number one plate. Winning Toowoomba was YZ250-mounted Berry Sweet/Lucas Oils/Yamaha rider Corey James, blasting past Wilson out of the first turn through the whoops and stretching to a 2.893-second advantage. Wilson and Jake Emanuelli (Raceline Pirelli Suzuki) filled the top three. New South Wales privateers Joel Wightman (Yamaha) and Blake Sola (KTM) completed the top five. In the points race it was Wilson the winner from James and Emanuelli. Yamaha Junior Racing’s Wilson Todd won the Junior Lites main event in Queensland by near 10 seconds in a convincing effort to complete the season. 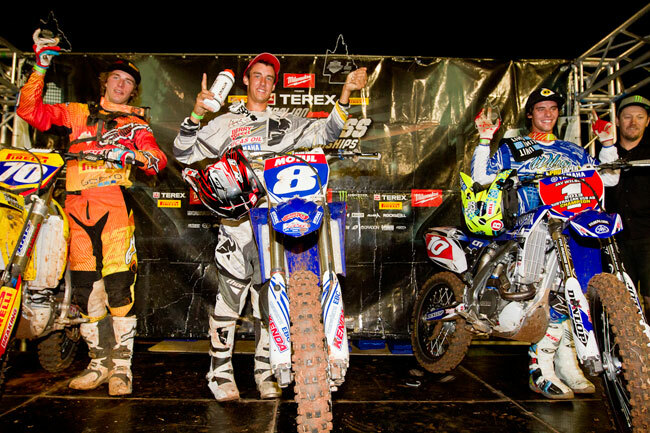 He won over Brock McLeary (KTM), while the final podium placing went to Trent Wheatley (Honda). McLeary was crowned champion on the night during the podium presentation, however Computime currently has Todd listed as the winner – those results pending the scoring of the Phillip Island rounds.